3. Behaviorally engage the fear and desensitize yourself to it by taking action. A well-referenced book that draws from both classical and recent thinking on how to overcome anxieties and fears. This he does, with frequent citations and references to multiple sources for understanding how these conditions evolve. The major sources for this book are fully referenced at the end, where there is also a list of suggested reading material that he hasn't quoted from. Any such work requires not only the above, but a list of solutions and a discussion of how they best work, given the evidence base for CBT: he describes interventions that he has used with his clients and reports that they found these to be effective. Over the forty-five years of his practice, he has clearly claimed to have developed numerous interventions of his own accord, but I note he also refers to not just these but others he has selected others from the quoted literature. This provides the reader with a menu of alternatives, to select what might best work for them, or a client. 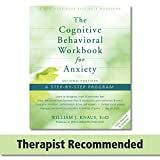 As a workbook, this is designed to help support the client-reader to apply CBT self-improvement methods in different contexts, challenge false anxiety assumptions, build tolerance for distress, and gain mastery over their emotional self. He describes these as basic techniques that apply to different problems and multiple techniques that apply to a specific anxiety. I note a lot of redundancy across the book, so presumably the reader can arrive at solutions via multiple pathways in the repeated approach in different sections. Not devoted to the sound of his own voice or ego, he has gone further and invited a group of top anxiety experts to contribute their preferred approach and strategies, what he calls tips. Their tips throughout the book are designed to again give different perspectives on what might be done to overcome anxieties/fears. Another key aspect of the book is a series of written exercises for self-improvement. In training people to become observers of their own behaviours, thus developing perspective, regulating emotions, and improving their outlook by reducing needless tension. As he shows, writing in the first person is associated with higher levels of self-improvement. As I note below, Part I introduces the world of anxieties and fears, showing users how to separate real from imagined fears and how to use basic cognitive, emotive, and behavioral strategies to overcome these conditions, by breaking a vicious cycle of anxiety using objective self-observation skills, avoid escalating anxieties, how to progress using self-management approaches, and how to get past procrastination barriers that interfere with change. Part II shows how to use guided imagery, namely natural scenes to achieve serenity, how to relax physically and regulate emotions triggered by cognition errors, the use of a classic ABCDE model to combat anxiety, and how to use key behavioral methods for overcoming fear. Part III examines how to break patterns of worry, manage anxiety over uncertainty, calm noxious physical sensations, overcome panic, combat phobias, and mount and sustain a multimodal attack against anxiety and fear. Part IV works on the ways to defuse anxiety-evoking expectations, as well as defeat harmful inhibitions, overcome anxiety related to self, gain freedom from troubling social anxiety, and overcome mixed anxiety/mood. He ends with the final chapter designed to preserve the gains made across the journey. In the first chapter, he introduces us to what he calls the world of anxiety, in that this problem is universal, no matter where you live. He includes a special evaluation toolkit he uses, which is most helpful. He begins his formal discussion in Chapter 2 with an impressive review of important aspects of anxiety, and this sets his work aside from a strictly self-help pulp book. This is a textbook, not just about the disorders, but an erudite introduction in the hands of a master of education. Self-help books are of course useful, but just do a drive-by at handy hints to target anxiety. This book enables expertise and a serious approach by the reader to become acquainted from both patient and healer perspective. Hence, the length and depth of the book requires some dedication to work through it, as a workbook, and is peppered with research citations to back up his narrative. As an exemplar of this, he notes that anxiety has two essential characteristics: aroused avoidance of a future threat and relief following avoidance, a concept that is often poorly dealt with both on its own, and in relation to the arousal. This has blighted recent anxiety self-help books that fail to deal with these two aspects, learning and avoidance, adequately. Whilst avoidance works as a good strategy for avoiding real and deadly dangers, it does not work when negative, repetitive, and alarmist cognitions are a painful part of the anxiety process. He notes in this vein that anxieties can come in clusters, and this makes a bad situation feel worse for the sufferer. For example, you can dread the thought of failing, so you avoid situations that evoke that threat such as a good scenery outlook point. Or you feel anxious about rejection and avoid social situations that evoke that threat and thus cannot date or enjoy parties. Whenever you avoid what you dread, you reinforce avoidance so that your anxieties keep coming back, as your message tells the anxiety source that there is indeed substance to the phobic response. If you dwell on your anxieties, they will expand. Attempts to shut down your anxious thoughts will ensure they keep coming back. You try to subdue the feeling, and you just get more. By correcting faulty thinking, you can decrease anxiety complications that come about from false assumptions. With anxiety, you live in dread of something horrible happening, and although unsure what will happen, you nevertheless assume it will be catastrophic. Faulty expectations. Magnification. Possibility thinking (a magical jump from the possible to the probable). Powerlessness thinking. Emotional reasoning. Fear of the feeling. Loss of perspective. False associations. All of these are invoked, to demonstrate the complexity of the brain-based pathways that can reason the client into an anxious state, or disorder eventually. He then moves to examine the underlying brain circuitry supporting these functions and providing the disorders when their work comes awry. Chapter Three then begins the actual working, with an evaluation at the end of the chapter as to how and what you have learned to do. Chapter Four draws on the need to become an accurate observer, given the role negative self-evaluations and rumination have on the creation and sustenance of the anxious state. As I mentioned, he has integrated boxes into each chapter with the Top Tip from other experts. As with the others, the chapter ends with more self-monitoring, in the form of a progress report. As he does often again, he introduces thinking from others, such as Ellis, and in Chapter Five refers to double trouble, namely being upset about aspects of being upset, layering anxieties on each other. The approach to then breaking a vicious double-trouble cycle would include dealing with problem magnification, overgeneralization, urgency and circular thinking, as well as a top tip from none less than Judith Beck. He finally invokes Karl Popper in thinking about falsifying double-troubled thinking. If something can be tested and falsified, which is easy to do with d-t thinking, then it can be subject to refutation and resolution in clearing up the stinkin'-thinkin'. A useful table contains five steps to help refute this kind of polluted cognition. He gives seven of his own tips for reducing needless distress and for building confident composure. He notes you can accept troubling thoughts and not magnifying, you can separate distress thinking from appropriate thoughts, hone in on cognitive triggers, look for false attributions, classify anxious thoughts, eg exaggeration and helplessness, tone down what he calls the drama, accept the work required, and so on. In the next chapter, he takes a leaf out of the Motivational Interviewing gurus and invokes Bandera and others in the pursuit of success via the route of self-efficacy, or the belief that you have the power to organize, regulate, and direct your actions to achieve mastery over challenges He notes that successful people meet challenges and overcome adversity since their actions express what they believe about their capabilities. Self-efficacy plays a central role in reducing anxiety and persistence in using effective counter-anxiety measures is a formula for mastery over fear and for promoting higher levels of self-efficacy. He notes you are more likely to create and sustain a positive new direction if you can assign the change to your own efforts rather than to medications, the fates, or luck. He further notes that self-efficacy is the major determinant of behavior, however, only when proper incentives and the necessary skills are present. He then produces a structured approach for controlling anxiety and fear, again with appropriate exercises to measure and manage the issues. Chapter Seven then follows with an attempt to address the vexatious issue of procrastination both initial and secondary, as well as decision making clarity which is affected, with the usual top tip and evaluations common to all the chapters. Part II then follows, with cognitive, emotional and behavioural ways to deal with anxiety. This begins with Chapter Eight's methods to achieve tranquility, relaxing body and mind (beginning with breathing) in Chapter Nine, including meditation and mindfulness. The next chapter, looking at the cognitive-emotion connection proposes a five step metacognitive solution, including dealing with the approach-avoidance and circular thinking common to anxiety. Ellis is again invoked with the ABCDE approach and while he notes that the ABCDE method will not mute normal emotions, such as loss, regret, frustration, and realistic anxieties and fears, it can target pathological thinking and thus go far to reduce needless tensions that grow from faulty expectations, exaggerations, and erroneous assumptions. Again, he uses a case study vignette to demonstrate how this is applied, and also the usual toolkits he has evolved, and the Top Tip of the chapter. The staple for all therapies is the well-established behavioural techniques repertoire, and here multiple case studies demonstrate the approach, especially successful when exposure and other behavioural approaches are required in phobias for instance. Having dealt with the fear, he now approaches the need to deal with worry and the 'web' it weaves, particularly with the differences between worry and anxiety, as well as the need to distinguish the probable from the possible. As he noted earlier, he deals with a few things from different angles in different chapters, as he does with these issues. Continuing his comprehensive approach, he examines anxiety in the face of uncertainty, with his layered approach dominating again, as anxiety about uncertainty increases the anxiety. There are five steps to freedom from anxiety over uncertainty, and having given much of this book away, I will not do so here. Awareness and fear of failure of course are two of these, and these and the others get the structured approach I have mentioned in the other chapters. The next chapter, focusing on physical sensations, includes the paradoxical tip of trying to worsen the symptoms after carefully noting them. My favorite, Occam's razor is also applied here to result in simpler explanations for troubling phenomena. By now we are at Chapter 16 and dealing with Panic, applying amongst others the ABCDE approach again. Another approach is again paradoxical, including forced hyperventilation, inducing a high heart rate, spinning around and so on, good exposure. The next chapter is about dealing with simple irrational fears, and the following one, a multimodal approach to anxiety, again, with the author attempting a comprehensive approach, exhausting all possible avenues which may be useful, which drives the value of this work further. This chapter includes the BASIC-ID approach, again a useful mnemonic for Behavior Affect Sensations - Imagery Cognitions and Interpersonal Drugs/biology including brain issues as well. You may think perfectionism is a single entity, but he has more to offer than just that, writing about learning perfectionism, social and self-perfectionism amongst other aspects, a series of issues seldom dealt with, moving on to self-inhibition in the next chapter to add to the multi-factorial nature of anxieties. Here, the mnemonic is PURRRRS and again I leave the reader to learn what this means. It does however again rely on pausing and reflecting in a cognitive solution series. PURRRRS is used to combat self-inhibition and hence avoidance in some ways too. Anxiety involves a lot of self-evaluation, often examining the self in ways no-one would really survive, undermining self-image and self-efficacy. The next chapter deals with self anxiety, and the contingency-worth trap. Namely, I am only something if I do or achieve something, even if this is harsh or even impossible an achievement. Again, an old, solid psychologist from the past, George Kelly is evoked, and the exercise is indeed about scripts. We know from animal studies that animals who struggle with anxiety can go from that to leadership roles, and so it is here that he deals with a possible transition from social anxiety to social confidence. He offers no less than 50 ways to defeat social anxiety and build confidence. Powerless thinking in the next chapter, part of a mixed anxiety-mood issue, is again dealt with by the PURRRRS acronym. Avoiding the return of the condition is the subject of the next chapter, as he brings together many of the already examined approaches with five quick steps to rally against the anxiety, lighten the allostatic load, work on building resilience through lifestyle alterations and so on. As promised, he finishes off with a suggested reading list and full reference list. An exhaustive approach that leaves no stone in history unturned, evoking expertise from now and back in the day, this book is THE definitive workbook for the client and therapist approaching anxiety, and I can't think of anything he has forgotten to address in a clear and structured fashion. The workbook tone dominates, with much done to achieve assessment and outcomes that are measurable, and I am sure this will resonate with all who buy this valuable book. Whatever the monetary cost, this is cheaper than therapy!